At the best of times, the world of logistics can be a minefield. Unless you buy-in logistics services on a regular basis, it’s very easy to fall foul of complex pricing structures and vague guarantees in terms of delivery times and dates. By outsourcing your world-wide exhibition logistics to a specialist exhibitions services company like 200m2, you can rest assured that your exhibition stands and promotional material will arrive on-time and in good order. What’s more, our breadth of experience and extensive contacts in the logistics world will ensure you receive value and no unexpected surprises. 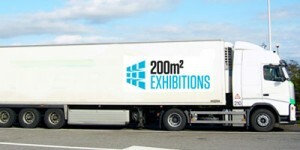 200m2 can take care of all your exhibition logistics requirements, from the shipping of your exhibition equipment to event merchandise. Road, Rail, Air or Sea… 200m2 can ship your equipment securely via any mode of transport you choose. Whether you need economical sea freight or immediate air cargo, 200m2 will do all the leg work for you so you can focus on your core business. We can also manage your corporate travel plans for you. With extensive travel contacts across the world, we can also ensure your people’s travel needs are catered for. From a coach transfer to a corporate jet, 200m2 can ensure your plans are delivered within budget. Find out how we can make your event run like clockwork, get in touch today.